Dry eye refers to a condition in which there is insufficient tears to lubricate and nourish the eye. When a person blinks, tears usually spread across the surface of the cornea lubricating the eye and reducing the risk of infection by washing away any foreign objects that may be present in the eye; creating a clear vision and comfort. Tears refer to the combination of water that moisturizes the eye, oils for lubrication, mucus for even spreading and antibodies and special proteins used for resistance to infections. An individual experiences dry eyes as a result of imbalance in any of the above. 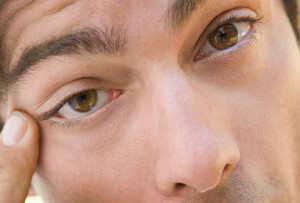 A person with dry eyes has the following signs and symptoms that are always evident in both eyes: blurred vision that regularly worsens at the end of the day, increased irritation from smoke or wind, eye fatigue, periods of excessive tearing, a stinging, blazing or abrasive sensation in the eyes, eye redness just to mention a few. However, sometimes a person with dry eye may have excess tears running down the cheeks that may be confusing. This condition arises when the eye sends a distress call through the nervous system for more enough lubrication by getting flooded with watery tears which lack the lubricating qualities or rich composition of normal tears. Hence, the water just washes away the debris yet it does not coat the eye facade appropriately. Numerous risk factors contribute to dry eyes. They include eating a diet low in vitamin A which is found in liver and carrots, having laser eye surgery, undergoing radiation therapy that are used to treat cancer of the eyes, taking medications that can cause dry eyes or simply being a woman. Apart from the imbalance in tear-flow system of the eye being a cause of dry eyes, dry eyes can be caused by other conditions that dry out the tear film such as the dry air coming from air conditioning or heat. Others include side effects from drugs such as the birth control pills, the natural aging process and effects from other diseases that affect the ability to make tears. By and large, dry eyes do not cause serious problems even though its complications might result into other eye problems like more frequent eye infections, scarring on the surface of the eyes due to inflammation and decreased quality of life as the victim will have difficulty in performing everyday chores. In treating cases of dry eyes, doctors sometimes recommend different medication in a case where a given medication causes has side effects in the eyes, or a case where one experiences difficulty in closing the eyes completely when blinking. In such a case he might recommend surgery. Consequently, antibiotics that reduce eyelid inflammation should be prescribed by the doctor. There is a need for individuals to understand the signs of dry eyes in cases of infection so as not to experience other complications, and seek medical attention in case it becomes chronic.